Want to end the cycle of job search rejection and instead be irresistible to employers? Want to have financial security and never, ever have to do a traditional job search again? 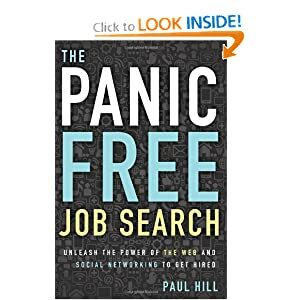 The Panic Free Job Search: Unleash the Power of the Web and Social Networking to Get Hired is about creating an irresistible offer that employers are attracted to and are compelled to act on. Forget about focusing on getting your foot in the door …When you unleash the power of the web and social networking to promote your career you open up the “world” of employers and bring them to your door step. The Panic Free Job Search will transform you. You will become self-confident, focused, and have the clarity to know what you want in your next job and most importantly what actions to take to get the next job that will advance your career. You will have a clear job search strategy and a step-by step plan, the tools you need to find and impress the right decision makers, the ability to deploy effective tactical interview techniques, the know-how to close the deal and get the job that is right for you. The game has changed and you can no longer count on an employer for your job security or for your career progression – The Panic Free Job Search will show you how to be proactive and take ownership of your career management. You will learn how to be a candidate and not an applicant and how to avoid being sucked in to playing the “click and send” your resume lottery game. Instead, you will exploit the new way employers find candidates and expand your career opportunities by attracting employers and recruiters to you so that you will never ever have to do a traditional job search ever again. From developing a professional, web-savvy profile, leveraging the power of LinkedIn, Facebook, Twitter, Google+, YouTube, and OneLoad, to even a personal website, The Panic Free Job Search is a must have resource that will get you on the fast track to HIRED! Especially in today's society where social networking is paramount to being connected and to networking, this book throws down the gauntlet and allows the potential job seeker to see some of the inner secrets to best using social networking to find a job. The book was well written and offers great advice that will assist anyone that is going through a job search to change the way that they are thinking about how they can or should be searching for and finding a job. This is the type of book that I can see anyone going through the job search should read as it will open their eyes to so many new ways of doing things that will make them so much more marketable and able to find employment in this unstable job market. This is really a perfect guide book for job seekers and they can get several tips and advice on it on how to have an effective job search.